Many of you will remember the old song, "The worms crawl in, the worms crawl out, the worms play penuckle on your snout!" Now that I have your attention, remember how as infants and children everything went into the mouth, including really disgusting things? Some parasites can live inside the body for up to 25 years! Parasites can be the cause of ADD, mood swings, and chronic fatigue in children and adults, and is even thought to possibly be responsible for the dramatic increase in the occurrence of inflammatory and supposed "autoimmune" diseases. Parasites are a common cause of yeast and bacterial overgrowth. Parasites are organisms that vary in size from microscopic to up to 30 foot worms, many of which can live for 10-25 years without ever leaving the body. The largest worm we have help a patient get out at the Hansa Center is twelve and a half feet long! The next largest was a six footer. We have had people who look healthy purge out literally many hundreds of worms with each bowel movement for weeks. So if you as reading this and saying to yourself, "This couldn't be me!" Just remember, we are all animals and the number one thing you do for your pets is deworm them. Most other countries around the world know to do a parasite cleanse at least twice a year, whether or not you have seen worms in your bowel movement, just to be on the safe side. The botanical remedies are usually very easy to tolerate, although there is always the exception. If you are chronically sick, then the chances are pretty good that you have parasites, since your body's defenses against parasites are already low. Bacteria and viral overgrowth can occur, due to immune-suppressing chemicals secreted by parasites. For those who still believe in the efficacy of vaccinations, research now shows that parasites can block the effectiveness of many vaccines. This research recommends that, "deworming might be essential for effective protective vaccination." Parasites compete with your own body for the nutrients you eat. In hyper-infections of parasites, the competitive uptake of nutrients can deprive your body of the nutrients so important to maintain balance. Parasites seem to most often consume B vitamins from your food and vitamin supplements. Without adequate B vitamins you cannot regulate your stress responses correctly, or produce hormones, or produce energy! This sets up a chain reaction of systemic deficiencies ultimately altering the body’s acid/alkaline pH balance. A normal pH balance in the body is important to maintain, because yeast and other microbes cannot survive and overpopulate unless the pH balance of the body is upset. An alkaline environment promotes health, while an acidic environment promotes dysfunction. Killing the parasites can go a long way towards bringing the pH back into balance. 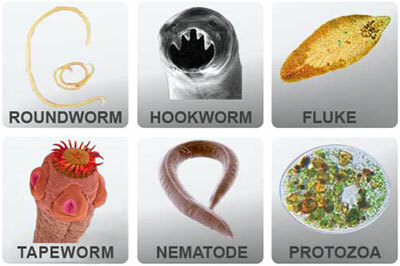 There are many parasite cleanses and supplements on the market. My personal favorite is the one I developed, Paragen, which is broad acting and gentle on the gut, as well as possibly being the best tasting of all the various liquid products on the market, making it very suitable for children and those with a sensitive palate . Other botanicals that are typically used are combinations of Black Walnut extract, Artemisia, Green Pumpkin seed, high-allicin garlic, and others. All of these can be found in various combinations in health food stores. They are generally well tolerated by most people and have a long track record of use. Clove oil is very important since it can dissolve the parasite eggs, not just kill the adult parasites. A powerful anti-parasitic, antiviral, anti-bacterial, anti-fungal remedy is ParaFree, a softgel loaded with various essential oils, from Young Living oils. Remember parasites are often not easy to eliminate and can require the help of your natural doctor to determine if you have them, and what your unique body needs to correct the problem. You should do a parasite cleanse at least two times a year no matter what. By the way, the egg of a tapeworm, the largest worm in the human body, is just a little bigger than the period at the end of this sentence. So keep your fingers out of your mouth and stop biting your fingernails, which are like little parasite egg filled shovels! For those of your with various bacterial, mold, and viral infections parasites can promote the hyper-infection by secreting immune-suppressing chemicals, so no matter how many antibiotics and antimicrobial drugs you take the infections will never go away!